Denise has worked in this field for many years, working at DSC for the past three years. She is currently the manager of the group home in Rantoul. Her favorite part about this career is interacting with the people and laughing. She also enjoys just experiencing everyday life, as the group loves to go out to eat, go bowling and take walks around a nearby pond. Denise lives in Rantoul with her two daughters. They enjoy spending time together by fishing and camping. 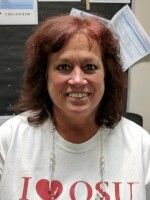 We are so happy Denise is part of the team at DSC!